Kings XI Punjab 3-176 (Adam Gilchrist 85*, Azhar Mahmood 61, Zaheer Khan 1-30) beat Royal Challengers Bangalore 5-174 (Chris Gayle 77, Virat Kohli 57, Parvinder Awana 3-39) by seven wickets. Royal Challengers Bangalore scored 5-174 in their allotted quota of 20 overs and Kings XI Punjab piled up 176 for the loss of just three wickets with 11 balls still remaining in the encounter. 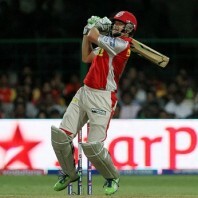 Adam Gilchrist (Kings XI Punjab) was announced ‘Player of the match’ for his express innings of 85 off 54 mere balls. The 63rd game of the Indian Premier League was held on Tuesday, May 14, 2013, at M Chinnaswamy Stadium, Bangalore. Adam Gilchrist won the toss for Kings XI Punjab and offered the batting to his rival team. Cheteshwar Pujara and Chris Gayle opened the innings for Royal Challengers Bangalore slowly by scoring 22 runs in 4.1 overs when the first was gone for 19. 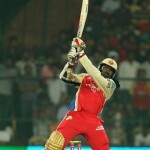 The skipper of RCB, Virat Kohli joined in next with Gayle and they reached 52 after the half way mark. Kohli hit the first six of the innings in the 12th over and Gayle followed him with one in the next over. The duo geared up from the 14th over by adding 10 runs with a couple of fours. Chris Gayle dispatched 3 successive sixes in the following over and smashed his fifth half century of the tournament as well. Virat Kohli gathered 13 runs in the 16th over with 1 six and 1 four and powered his 6th fifty of the event two overs later with a four. Gayle continued with his militancy by getting regular boundaries but was finally clean bowled by Parvinder Awana for 77 off just 53 with 6 mighty sixes and 4 fours. The third wicket fell at 164 in 18.5 overs and Virat Kohli became the next victim two runs later for 57 off 43 with 2 lofty sixes and 6 fours. A couple of wickets fell cheaply as Royal Challengers Bangalore managed 174 for the loss of five wickets when the last ball of the 20th over was bowled. Parvinder Awana was the highest wicket taker with three wickets whereas Azhar Mahmood claimed two. Kings XI Punjab started the chase nicely and got 24 runs in 2.2 overs with 3 fours when the stumps of Shaun Marsh were destroyed by Zaheer Khan. Azhar Mahmood got together with Adam Gilchrist and the first hit 3 back to back fours in the sixth over. 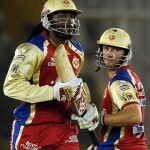 Gilchrist got 3 boundaries in the coming overs and the pair kept on cruising briskly. The hundred of the innings was displayed on board in the 13th over with one boundary from each batsman. Adam Gilchrest posted his maiden fifty of the tournament with a six and Azhar Mahmood thrashed his second fifty for his team in an identical fashion. The target was made easy by the two batsmen since their team required just 35 runs to win the match from the last 30 deliveries. The second wicket partnership enhanced the score to 142 in 15.2 overs as Azhar Mahmood was caught by AB de Villiers off Jaydev Unadkat for 61 from 41 with 1 six and 8 fours. David Miller walked in next as Gilchrist continued his onslaught by dispatching 2 consecutive sixes in the 17th over. Miller became the third victim at 162 after Muttiah Muralitharan dislodged his stumps for just two runs. The incoming batsman Rajagopal Satish hit the winning four on the first delivery of the 19th over as Kings XI Punjab amassed 176 runs. Adam Gilchrist demonstrated a herculean batting and secured his end for 85 from just 54 deliveries comprising 3 giant sixes and 10 well timed fours. 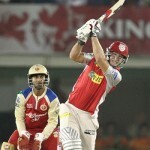 Kings XI Punjab won the interesting game with a hefty margin of seven wickets and added two points to their table. Royal Challengers Bangalore – 16 points from 15 games – 4th position. Kings XI Punjab – 12 points from 14 games – 6th position.